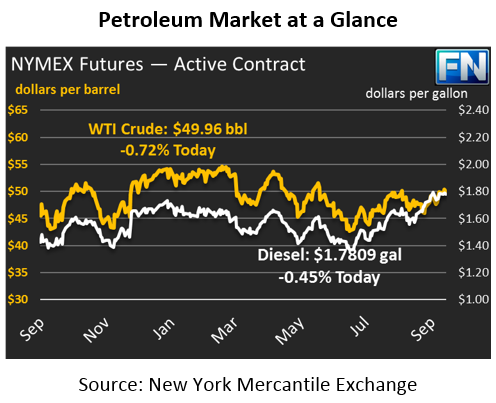 Crude prices are relatively flat this morning, continuing to hover between $49-$50. Prices continue struggling to break out above $50; however, prices reached a high of $50.42 during late night/early morning trading before edging back down to the current price of $49.96, just under 1% higher than yesterday’s close. Refined products are mimicking crude this morning, both remaining mostly flat with minimal gains. Diesel prices have increased only 83 points since yesterday’s close and are currently $1.7809. As mentioned yesterday, diesel prices remain elevated, and are over 3 cents higher than prices a week ago. Gasoline experienced less change than diesel with prices gaining only 5 points (.03%) from the previous day close of $1.6550. Prices are currently $1.6555, and though hardly changed from closing, they are down over a penny from yesterday’s opening price. Prices continue to stabilize as the market recovers from volatility brought about with the recent hurricanes. The American Petroleum Institute released their weekly inventory numbers, the data was much more bullish than markets expected. Crude inventories rose just 1.4 million barrels (MMbbls), compared to the market’s estimates of 3.5 MMbbls. Gasoline and diesel stock both fell substantially, together adding up to a 11.2 MMbbl draw. Markets are growing skeptical of the reports, and will be watching the EIA’s inventory report closely this morning. While Harvey did significantly disrupt supplies, barges of foreign crude and refined products have been lining up to bring more product into the country. Where is all that product going? Some suspect that Customs agents in Texas ports have become backlogged and have not reported all of the incoming oil products. If that’s true, the EIA and API will need to make some big corrections down the road showing significantly more stocks available.